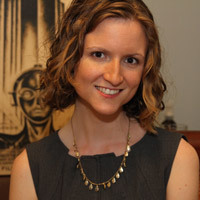 Danielle Picard is a historian of nineteenth and twentieth century Europe with research interests in the history of human sciences, science communication, history of the body, and the digital humanities. My current research projects examines how scientific knowledge of the body was used to address problems arising from industrialization in the early twentieth century. It addresses the relationships between scientific knowledge and contemporary issues of labor, scientific discourse, and disability in interwar Europe. Most importantly, my research asks how culture and politics affect the public’s understanding of science and the ways scientists communicate science to policymakers and lay populations. I currently hold an appointment as a post-doctoral fellow and lecturer in the History Department at Vanderbilt University, where I also serve as the administrator of the Vanderbilt History Seminar. My interest in Digital Humanities and Digital History stem from my years working as a programmer and website/graphics designer in industry. There, I used my skills in programming and research to help design sonar systems that could detect and track marine mammals based on their vocalizations. My current projects include GIS mapping, network analysis, and digital timelines. I am a dedicated and award-winning scholar and teacher. I have won teaching awards from both the Vanderbilt College of Arts and Sciences and the University of Rochester. I received two Graduate Teaching Fellowships from Vanderbilt’s Center for Teaching to develop programming for graduate students, postdoctoral fellows, and faculty on research-based pedagogy. My research has been supported by a variety of fellowships and research/travel grants including from the National Science Foundation, the History of Science Society, the Central European History Society, and the HASTAC Scholar award from the Curb Center for Art, Enterprise, and Public Policy. I was awarded the Willson Coates Book Prize for research from the University of Rochester. I received a dissertation completion fellowship from the Robert Penn Warren Center for the Humanities for the 2017-2018 academic year. My service includes organizing several THATCamps (including for the History of Science Society and Vanderbilt University) and multiple regional, local, and graduate conferences and workshops (including the Southern History of Science and Technology Conference, a workshop on marine and sub-marine histories, and several graduate conferences). I served two terms as President of Vanderbilt’s History of Science and Medicine Society (2016-2018). I received a Ph.D. in History at Vanderbilt University in 2018, an M.A. in History from the University of Rochester (2012), and a B.A. in History and Psychology from Rollins College (2008). You can find me on Twitter @DRPicardHIS. 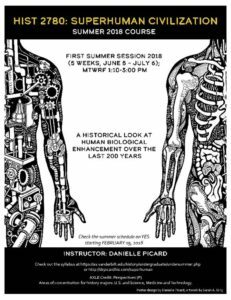 April 10, 2018, 4:10pm: Presenting at the Robert Penn Warren Center for the Humanities, “Resisting Robots: Analyzing the Human Factor in British Industrial Psychology, 1919-1939.” Open to the public. Reception to follow. Dec. 5, 2017: Awarded the 2017 Outstanding Graduate Student Teaching Award from the College of Arts and Science, Vanderbilt University. Nov. 12, 2017: Co-organized THATCamp at the History of Science Society’s annual meeting in Toronto, ON.